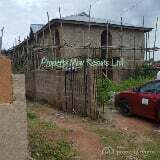 3 bedroom flat (uncompleted building), located at Dada estate osogbo, egbedore local gov't, Osun State Nigeria. ...Capital City Of Osun State). It Has 3 Main Pumps And A Space For Diesel Pump, A Mini Mart, And Lube Section. All Title Documents Are Available. Office Complex/ Plaza is a Two. Storey with (5) Offices, (20) Shops/Offices. The Property is right at the city centre and Covered with C of O. Plots of land for sale in Apara, Osogbo oustkirt. The land is along Osogbo Ilesha road and its facing the tarred road with 450 square meters. A storey building with boys squarter at olaiya junction, located in a strategic position in the center of osogbo town. Good for office and shops.